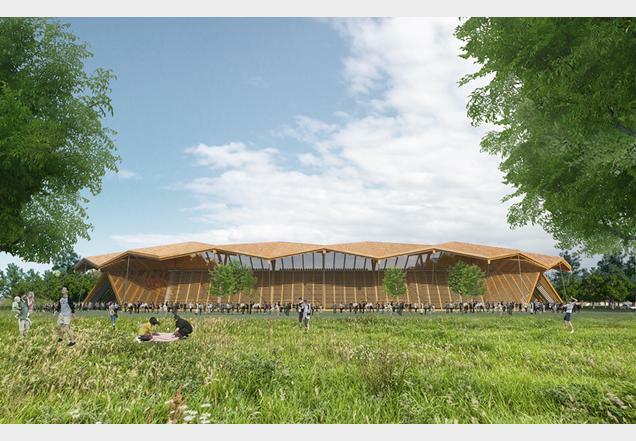 Wednesday 5 April 2017 – Ecotricity has revealed two concept designs by Zaha Hadid Architects for the Green Technology Hub at Eco Park, alongside unveiling a new ‘Gateway to Stroud’ at a business breakfast this morning. Over one hundred businesses attending the event will see the ‘Gateway to Stroud’ proposal – comprising a new dual-carriageway on the A419, concept designs for Eco Park’s Green Technology Hub, the new Forest Green Rovers football stadium, and a Zaha Hadid designed footbridge linking the two main sides of the development. Ecotricity has applied to Stroud District Council for outline planning permission for the development, which the company hopes will be granted in the next few months. 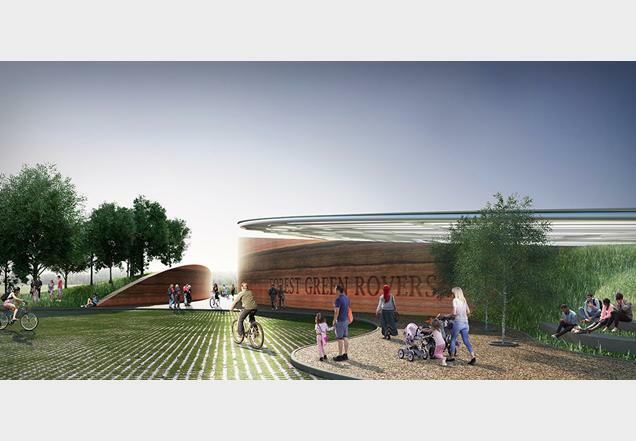 A spokesperson for ZHA, said: “The bridge design creates one single, fluid form by fusing together individual timber elements. 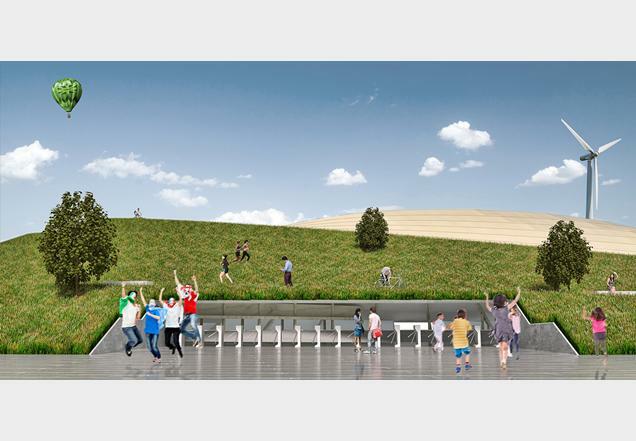 This important, unifying gesture builds connections for the community, conveying Eco Park as a facility for all. 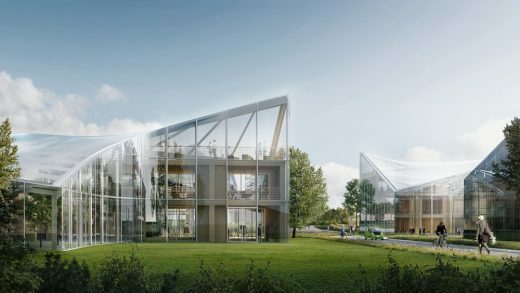 While currently just at the concept stage, a decision on the final design of the Green Technology Hub will be made as part of the full planning application. Eco Park is a proposed 100 acre sports and green technology centre at Junction 13 on the M5 – with 50 acres dedicated to creating state-of-the-arts sporting facilities, including a new stadium for Forest Green Rovers, while the other 50 acres will comprise a green technology business park capable of creating up to 4,000 jobs. For more details on Eco Park, see Ecotricity’s website: www.ecotricity.co.uk/eco-park. Ecotricity was founded in 1995 as the world’s first green energy company and now supplies almost 200,000 customers across Britain from a growing fleet of wind and sun parks. 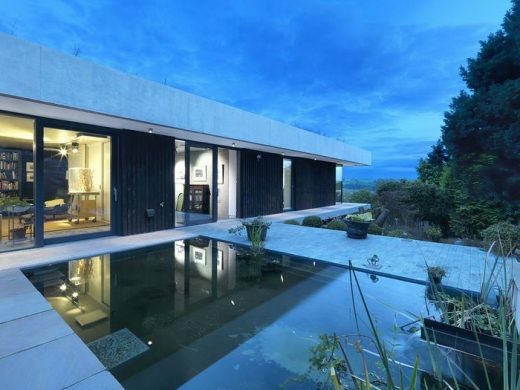 Ecotricity is a ‘not-for-dividend’ enterprise that, on average over the last eleven years, has invested more per customer in building new sources of green electricity than any other energy company in Britain. 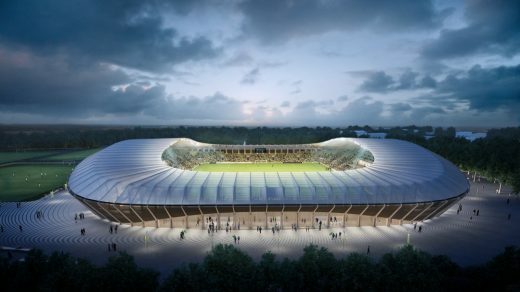 Thursday 3rd November 2016 – Following a seven-month international competition, Forest Green Rovers has selected Zaha Hadid Architects to design its new 5,000 seater football stadium. 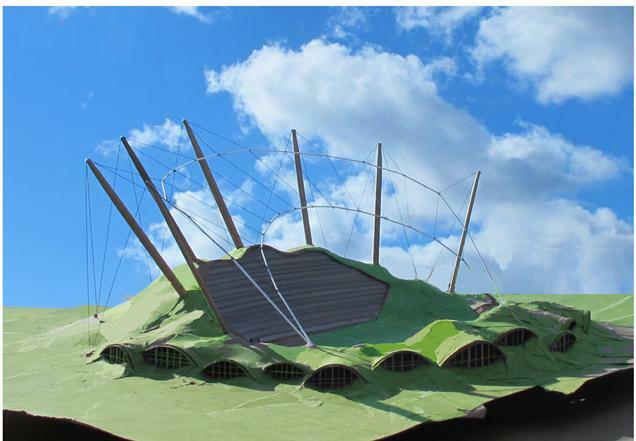 Forest Green announced the competition in March this year, and quickly received over 50 entries from architects around the world, including Sweden, Germany, France, Britain and the United States. 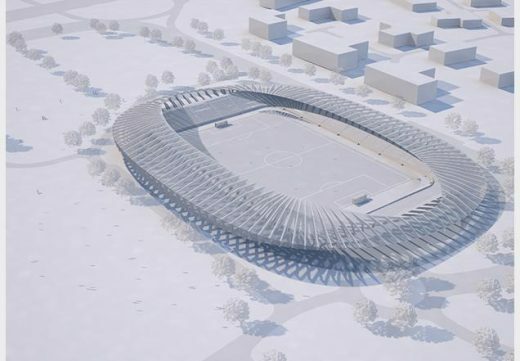 In May, the football club shortlisted nine entries, before selecting two finalists in August, who were given another two months to take their concepts further, including building scale models. 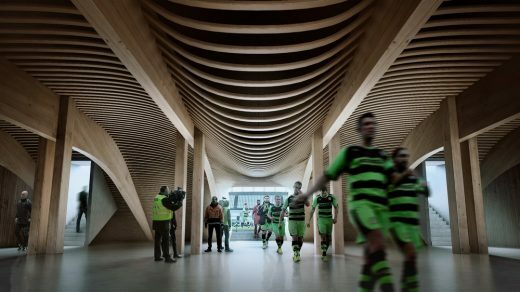 Dale Vince, Ecotricity founder and Forest Green Rovers chairman, said: “Zaha Hadid have built some fantastic sport stadia around the world, including one at the Olympic Park in London; they’ve designed one of the five stadiums for the next World Cup in Qatar, and now they’ve designed one for Forest Green. 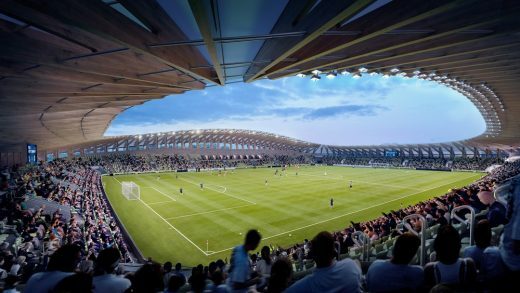 “The really standout thing about this stadium is that it’s going to be entirely made of wood – the first time that will have been done anywhere in the world. 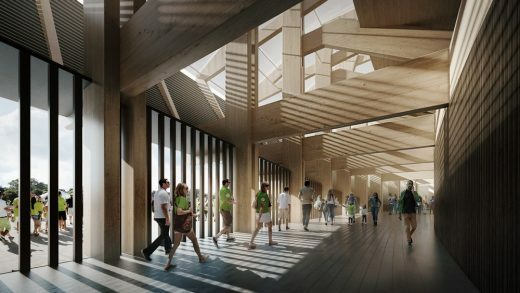 “The importance of using wood is not only that it’s a naturally occurring material, it has very low carbon content – about as low as it gets for a building material. “And when you bear in mind that around three quarters of the lifetime carbon impact of any stadium comes from its building materials, you can see why that’s so important – and it’s why our new stadium will have the lowest carbon content of any stadium in the world. 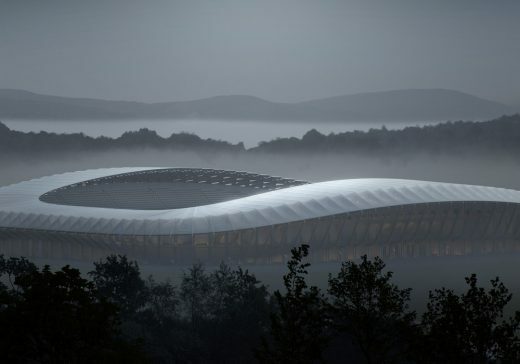 “We’re thrilled with the concept and the amount of thought Zaha Hadid put into their design – their experience of stadia design and their ability to put environmental issues at the heart of what they do really stood out. They took a really challenging brief, ran with it, and have given us an iconic and original new stadium. 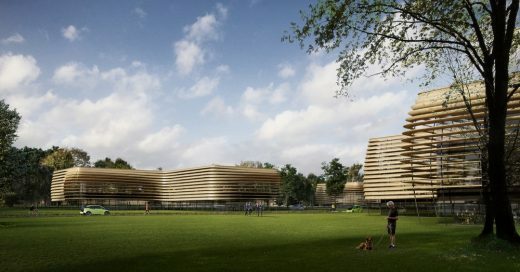 Zaha Hadid Architects have won numerous architectural prizes, including the Royal Institute of British Architects’ (RIBA) top Stirling Prize two years running, for the MAXXI Museum in Rome (2010) and the Evelyn Grace Academy in Brixton (2011). Founder Dame Zaha Hadid, who passed away earlier this year, was awarded the first Pritzker Architecture Prize in 2004 – often referred to as the ‘Nobel Prize of architecture’. Jim Heverin, Director at Zaha Hadid Architects, said: “We are very proud to be selected to build the new home for Forest Green Rovers – it will not only be a new stadium, but also an important addition for the community. The club’s heritage, ambition and vision reflect our own, combining the latest material research and construction techniques with new design approaches to build a more ecologically sustainable and inclusive architecture. “With the team’s community and supporters at its core, fans will be as close as five meters from the pitch and every seat has been calculated to provide unrestricted sight lines to the entire field of play. 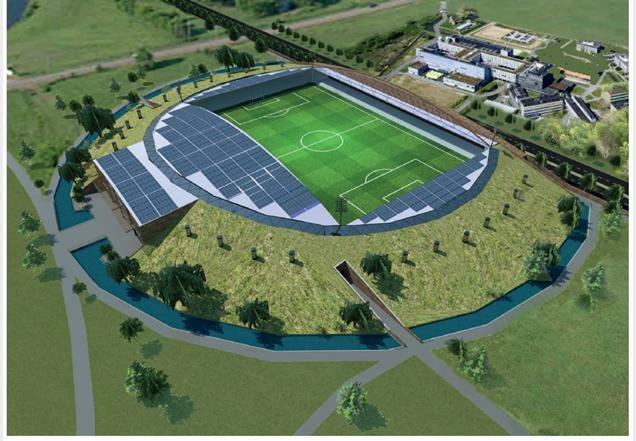 The stadium’s continuous spectator bowl surrounding the pitch will maximise matchday atmosphere. 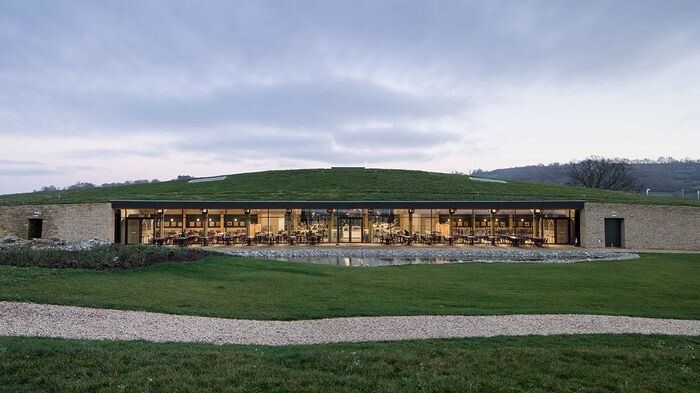 The runner-up entry came from Glen Howells Architects, the firm who designed the award-winning Gloucester Services on the M5. 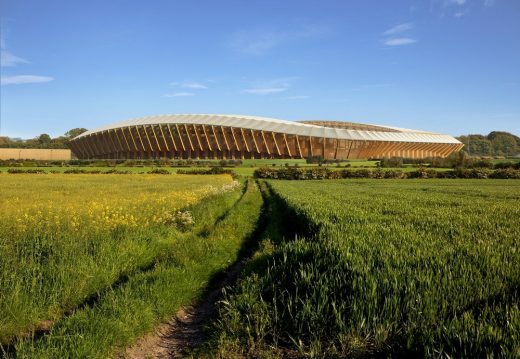 The Zaha Hadid designed stadium will be the centrepiece of the £100million Eco Park development – Ecotricity’s 100 acre sports and green technology business park proposal, beside junction 13 of the M5 in Gloucestershire. 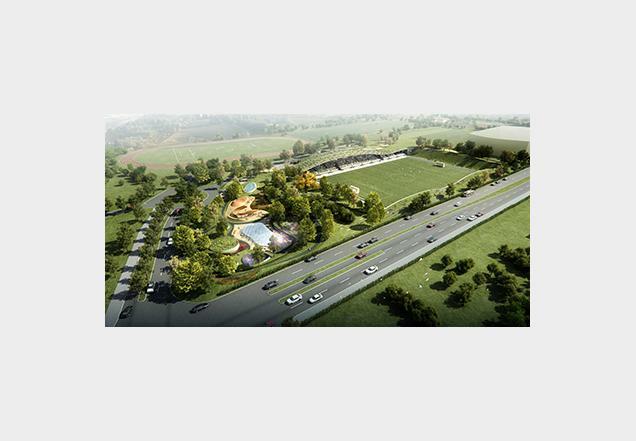 Half of Eco Park will consist of state-of-the-art sporting facilities, including the new stadium, grass and all-weather training pitches, publicly accessible multi-disciplinary facilities, and a sports science hub. The other half will comprise a green technology business park with sustainably built commercial offices and light industrial units, giving Eco Park the potential to create up to 4,000 jobs, including room for the continued expansion of green energy company Ecotricity, who have submitted the overall proposal and who are already the biggest employer in Stroud with 700 people located across four sites. 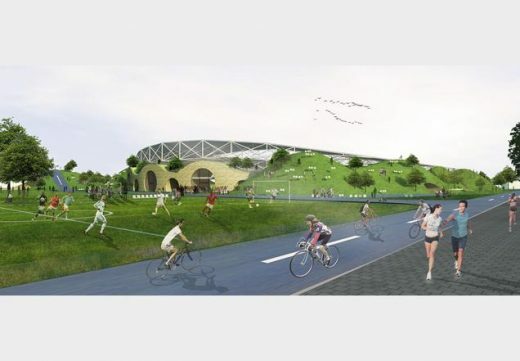 The proposal will also see the development of a nature reserve on the site, a potential public transport hub, including a Stroud Park and Ride, as well as help with the restoration of the Stroudwater canal. 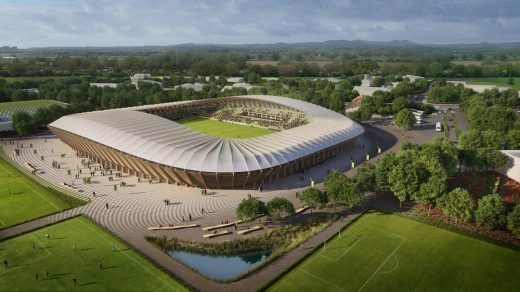 Glenn Howells and Zaha Hadid Architects qualify for Forest Green eco-stadium, reports the Architect’s Journal. 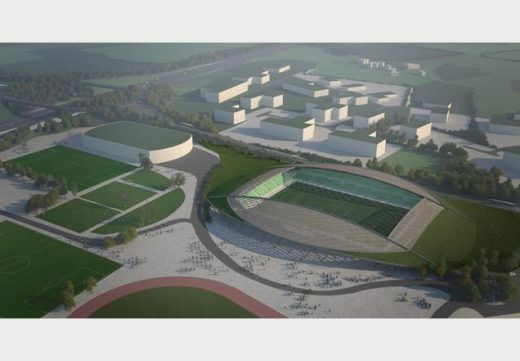 FGR Design competition Finalists revealed for £100 m new football stadium project for a semi-professional football club in Gloucestershire. The proposal also includes a nature reserve and a potential public transport hub, including a park-and-ride, as well as help with the restoration of the Stroudwater canal.